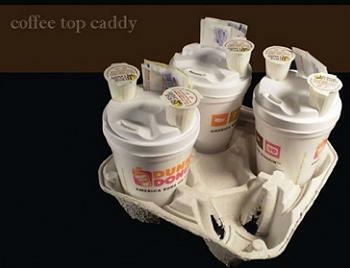 This Coffee Top Caddy is a brilliant idea, and I’m sure that anyone who has ever picked up coffee for a friend/family member/coworker/boss will agree. It is hard enough to mix in enough cream and sugar to your own coffee, trying to figure out exactly how much milk and sugar someone else takes in theirs adds pressure to any coffee run. 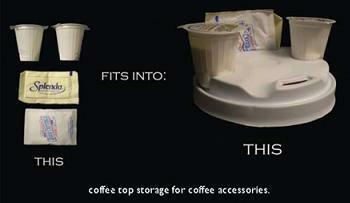 Designer Josh Harris made a few modifications to the basic design of a plastic coffee cup lid that allows it to securely hold packets of sugar and tubs of creamer easily. So, you can pick up your coffee and various condiments and mix it all together back in the office – and so can anyone else whose drink was on the coffee run. Your hands are kept free to hold the drinks and you don’t need to fuss over hot drinks at a busy condiment bar.